Last week, we spent a few nights at Tunkwa Lake Resort, which is a long-time favourite for many anglers in the Lower Mainland. For decades, grandparents, parents and children have visited this resort and built trout fishing memory together. 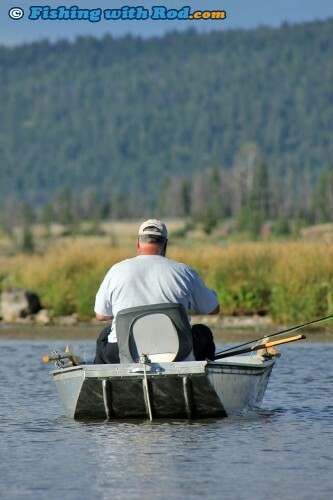 Fishing opportunities from Tunkwa Lake Resort are plentiful. 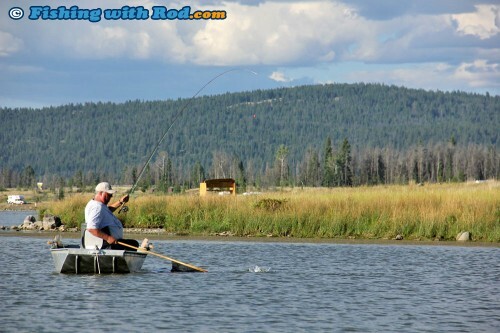 If fishing Tunkwa Lake is slow, you have the option to visit one of many lakes in the area. Logan and Leighton Lakes are just two other popular spots where you can visit. 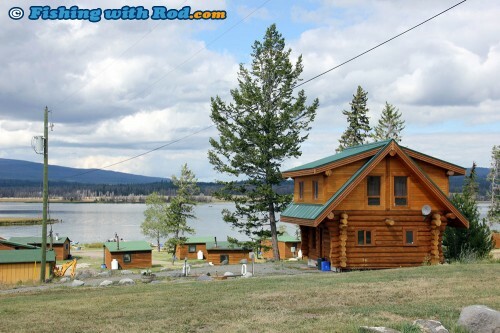 We were spoiled by one of two luxury log cabins available at the resort. This place is fully equipped with a kitchen, hot shower, satellite television and wireless internet access. 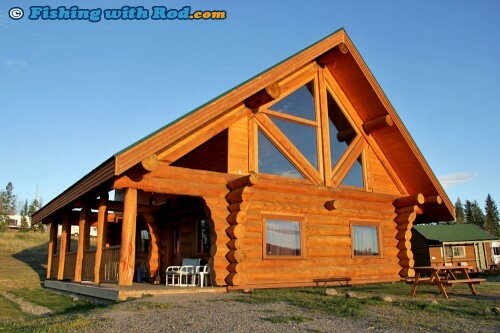 If luxury is what you want to leave behind when visiting this area, then the rustic cabins are for you. These cabins come in all sizes, catering groups of two to six. 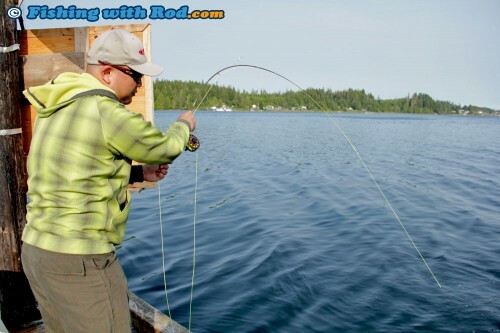 The plan during this particular trip was to complete a couple of filming projects for both our website and Go Fish BC. You will be able to see these video features in a few months from now. 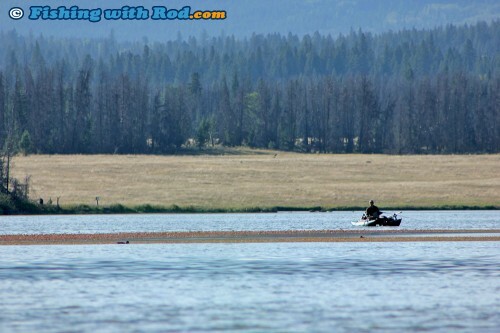 Fishing at Tunkwa Lake was quite challenging due to an ongoing algae bloom in recent weeks. The fishing is usually quite productive in early August, due to the hatching of “bombers”, the larger chironomids found in this area during the summer. 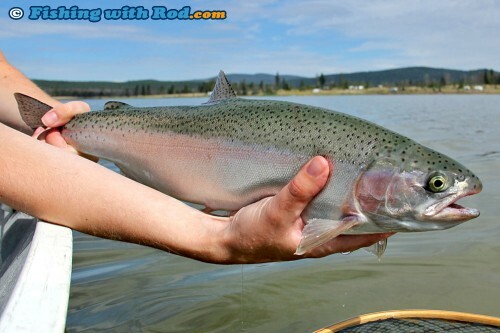 The timing of our visit was a little off, those rainbow trout in Tunkwa Lake were definitely not tempted by our flies. In the end, Nina’s Rooster Tail spinner yielded the only large fish. 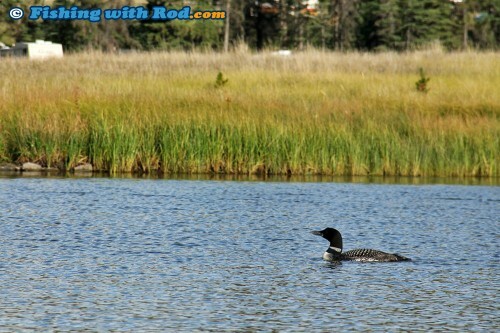 Since condition was not favourable at Tunkwa Lake, we decided to take a short drive to Logan Lake for the day. We had been told fishing was much better at this little pond. Our guide of the day was a very knowledgable local angler, who is pretty well known across North America in the fly fishing world. Brian Chan generously took us out to show me the tricks in this trade while Nina documented all with the camera so we can show it to you in a video feature later this year. The water was clearer and fish were more active, but it took us awhile to finally dialled in. At first we were having trouble with figuring out what exactly they were feeding on. Chironomids were not producing and eventually bloodworms seemed to be the ticket. Stomach content from a throat pump showed that they were feeding on the odd scuds. By the end of the trip, we were able to connect with around a dozen fish, ranging from 1 to 3.5lb. 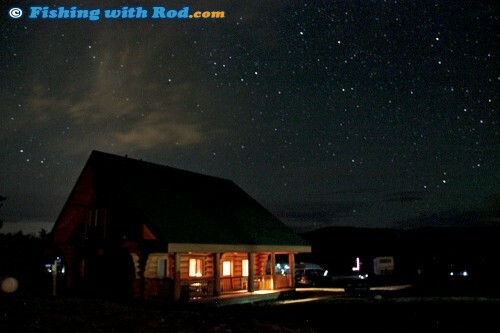 One of the highlights of these trips that we do is being able to stand outside late at night to view the night sky. Blanketed by total darkness, we were able to see many more objects in the sky. For two nights, the sky was clear above us, while lightning storms were happening in the horizon all around the resort. This resulted in a rather spectacular light show, which we never get to see in the city. If you still have not experienced fishing opportunities beyond the Lower Mainland, then you should definitely give Tunkwa Lake Resort a try. You can try the trout fishing year round, fly fishing in the summer and ice fishing in the winter. Boats are available for those without one. Once you experience what this region has to offer, you will keep returning and exploring the other hundreds of lakes where hungry trout are waiting for you. Ucluelet, West Coast Vancouver Island, Gravol, images of large chrome springs, barn door sized halibut and 6 feet high swells had been on my mind for nearly a month as I eagerly waited for the much anticipated day to come. 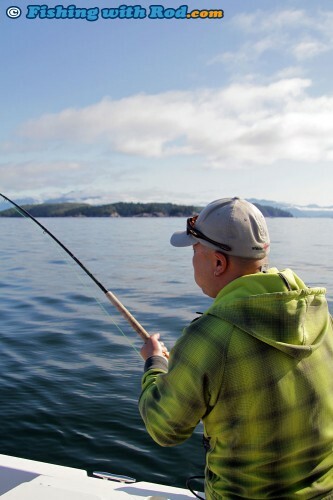 Fishing from a boat on the ocean for me was something that I had very little experience in. 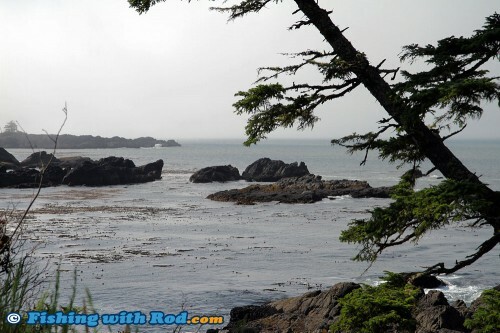 After catching the afternoon ferry from Horseshoe Bay to Nanaimo, we drove the scenic and windy road to Ucluelet and arrived at our destination, the beautiful Black Rock Oceanfront Resort where Rod was waiting for Dion and I. Upon our arrival, we proceeded to oooh and ahhh at the lodgings as the setup was gorgeous! Everything from the in-suite kitchen to the beautiful bathrooms made us feel very welcome. Situated close to the ocean’s edge, the view from our suite was breathtaking. Apparently, during the winter storms, the ocean waters can come up to within inches of our patio! The full service resort consists of several complexes, some are built on the black rock cliffs above the water (hence the name!) while others are set off of the beach with all offering spectacular views. Various packages ranging from sea kayaking to more relaxing spa packages are available for the non-fishermen, making this a resort suitable for everyone! If you are looking for a sit-on-top kayak, click here. 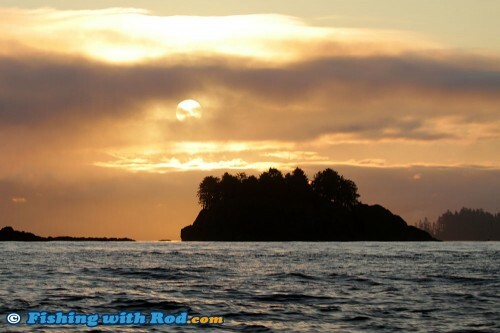 We conversed and relaxed for a bit to find out what the plan was for the following morning and then headed to bed fairly early, as we were to be on the dock bright and early at 6:00am to meet up with the guide from Big Bear Salmon Charters. Possibly due to excitement and anticipation, sleep did not come easily and the 5:00am alarm came all to quickly. 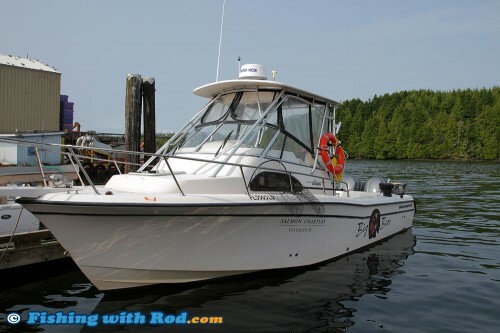 A quick breakfast of coffee and a Gravol, and we were off to the docks to be greeted by our guide Brett and one of Big Bear’s 31ft Grady Whites outfitted with two 225 Yamaha outboards. As we made our way out to open water, we were greeted by a breathtaking sunrise as the sun slowly rose up from the east, showing itself through the light marine fog. It was determined that we would be fishing inshore as there were 30 knot winds forecasted for the late morning offshore which would make the sea rough and dangerous. 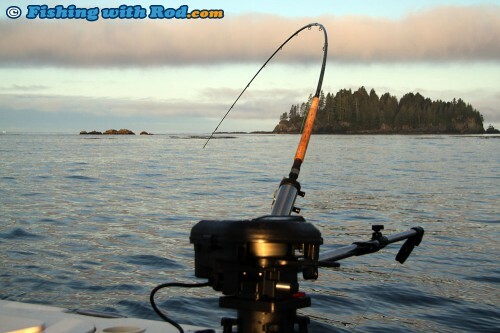 Our boat started the day off in search of chinook salmon as we trolled both hootchies and spoons at various depths. Brett gave us a brief tutorial on the 2 different kind of “hits” that were expected off the trolling rods and how to set the hook accordingly. As there were four of us on the boat, Dion would get the first fish, myself the second and Brian and Rodney would take the third and fourth. Soon after dropping our gear, we got the first hit and the line was released from the clip on impact but unfortunately for Dion, the fish was not there. On the next hit, Dion was able to set the hook and landed a chrome spring of about 16lbs. I was up next and as we trolled around, I couldn’t help but think that I should have gone to the washroom while Dion was waiting for his fish. I decided to relieve myself, when sure enough, as I was in the head, fish number 3 hit! Because everybody was being polite and wondering where I was, we were late to grab the rod and set the hook. By the time we grabbed it the fish was long gone! Need to be quick! Fortunately for me, we didn’t have to wait long for the next opportunity and I was ready! With the rod bouncing up and down, I reeled in and set the hook hard. After a spirited battle with multiple runs, dives and head shakes, a chrome spring of about 18lbs was expertly netted by Brett. It was my first ocean caught spring and I still have a grin on my face as I type this. Actions seemed to slow down after that and we ended up with four hits and two springs landed. Fishing this year was not as good as in previous years because the fish were either late or just not there, but we seemed to do better than most, if not all of the other boats in the area where we were fishing. The second half of the day was spent looking for halibut. Backtrolling with two bait rods and jigging with another, we went to the grounds where our guide, Brett, had landed a 140 pounder just two days prior to our trip. 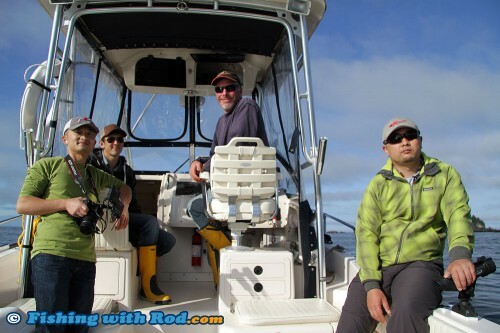 Despite of Brett’s best efforts, we were unable to hook up with any halibut but we did find enough lingcod and rockfish to keep us entertained. After our day was over and the fish were cleaned, we returned to the resort for some rest before grabbing our light gear to fish for the plentiful mackerel that were hanging around the dock. Fishing from a big boat, whether in fresh or saltwater, is something that for whatever reason makes me feel like a little kid again. The excitement of speeding through the waves and the ocean spray make fishing almost seems like a bonus. Click here to watch the 30 minute video feature of this trip! 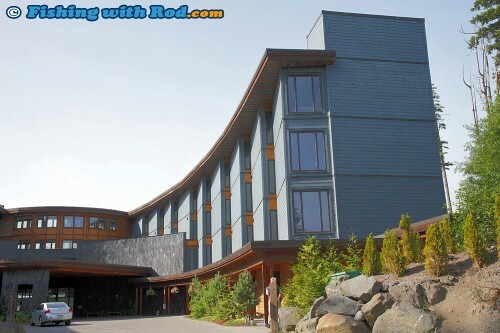 A big thank you to Black Rock Oceanfront Resort, which offers beautiful lodgings set in an equally breathtaking location with lots to do even for the non-fisherman in us. 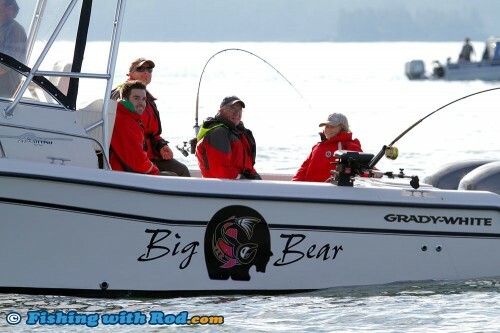 Another big thank you to Big Bear Salmon Charters, which worked hard to get us into fish even though the fishing in general has been challenging this year. 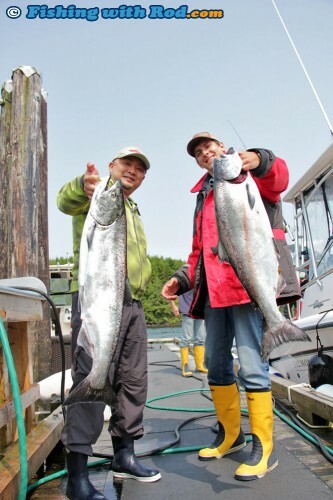 If you are interested in a memorable fishing trip to the West Coast of Vancouver Island, definitely consider asking for a special fishing/accommodation package from Big Bear Salmon Charters and Black Rock Oceanfront Resort! While we were in Ucluelet last week, we couldn’t stop noticing the high abundance of mackerel that were swimming in the harbour. 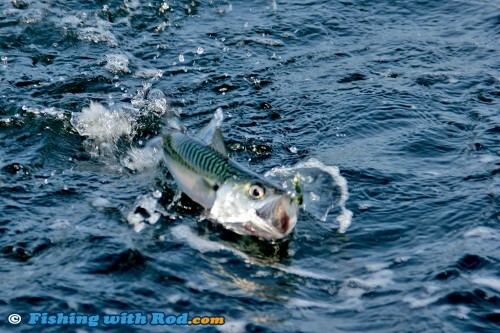 Mackerel, or chub mackerel to be precise, typically reside in the Pacific Ocean further south from British Columbia. They creep into this part of the ocean during years when warmer ocean current makes its way to the north. It can be problematic, as these pelagic fish predate on juvenile Pacific salmon as they travel from the estuary to the ocean. They travel in large schools and are highly efficient when feeding. After our salmon and halibut fishing trip with Big Bear Salmon Charters, we just had to try getting a few of these mackerel on our light tackle from their floating dock. These fish are in fact very fun to catch when matched with the right gear setup. It is a species that I used to target while living in Australia during my teen years, so I was rather excited to be able to experience it again. We brought our ultralight spinning rod and 3wt fly fishing rod. The choice of lures and flies did not really matter, because they seemed to be chasing anything that moves in the water. Whenever a fish was hooked, a few dozens would chase behind it. This made some pretty spectacular feeding action. Most of these fish were in the 12 to 14 inches range, but the odd ones were much bigger than the rest. 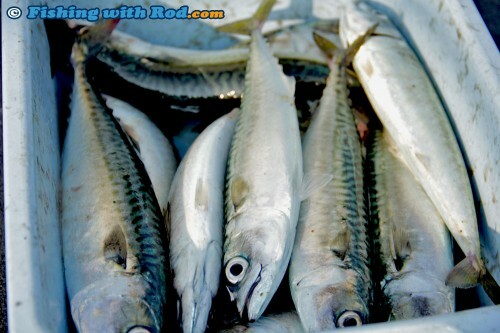 A few fish that we hauled in were easily three or four times bigger than the rest. While British Columbians are pretty familiar with eating our salmon and trout, we know very little about eating mackerel. This is in fact a rather widely eaten species around the world. They are grilled in Asia, pan fried in Southern Europe, smoked in Northern Europe. They are rich in oil and flavour, which can be quite delicious when cleaned and prepared properly. We brought a few dozens back home to enjoy. 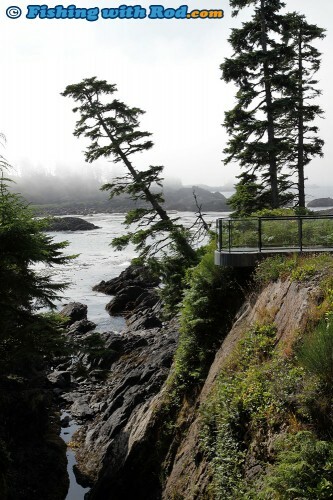 We also had the opportunity to help Ucluelet Aquarium during our stay. They needed some live mackerel to be transported to Vancouver Aquarium for display and we were glad to assist. If you drop by the aquarium in the near future, perhaps you’ll get a chance to see some of these fish caught by yours truly. 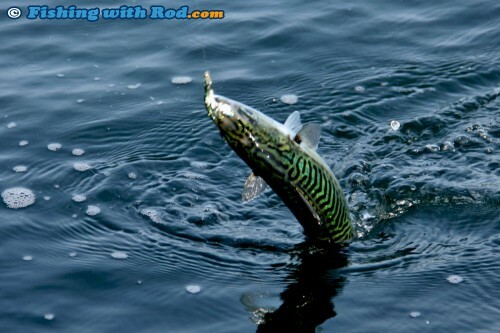 Here is a seven minute video feature of our mackerel fishing experience! 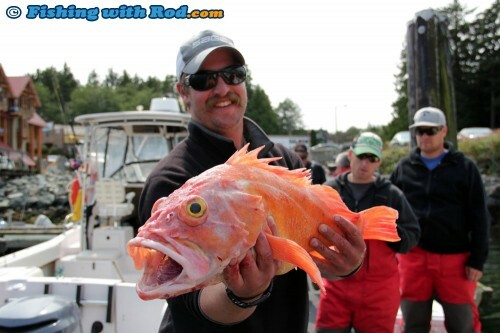 If you are heading over to the West Coast of Vancouver Island in the next couple of months, be sure to pack a light rod so you can also experience this fishery.